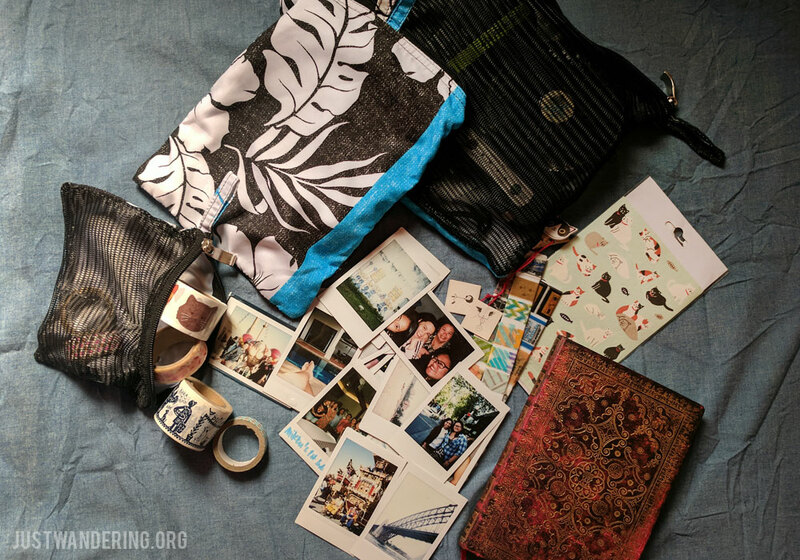 In the ten years I’ve been traveling, I’ve gone through so many travel gears and accessories. There are some that other people have sworn by, but I find not quite fitting for me and my style of travel. I have items that I’ve had since I started, and continue to buy when it wears out. And then there are those that I said were not necessary, but when I was able to try it, I had to swallow my pride and admit that they are indeed life-changing. Here’s another list of things I use in my recent travels. I’m pleased to note that there are now great Filipino-made travel gears and accessories that highlight the local crafts and provides jobs in their communities. I used to have a nondescript laptop sleeve, and would have continued using it if I hadn’t seen this very cute laptop cover from Woven.ph. 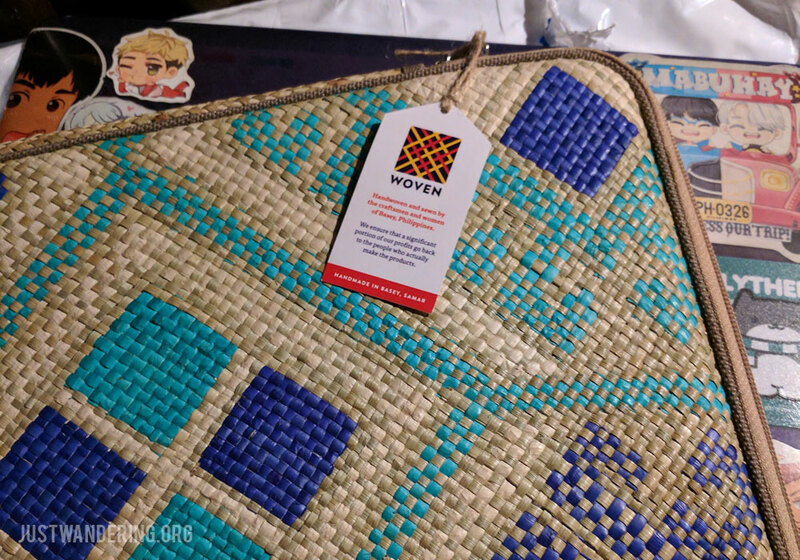 I’ll be the first to admit that this is not a necessity (especially if your current laptop cover is still in good condition), but I just could not pass up having a banig (woven mat made with local dried leaves) for a laptop cover! Products like this showcases the local crafts, and create jobs and opportunities in rural communities where skills for making banig are not seen as a viable income stream. The case costs Php 944 (including shipping within Metro Manila), and can be purchased by sending them a private message on Instagram. I’ve been seeing Wanderskye luggage covers for a while, and they became really popular at the height of the laglag bala scare a couple of years back. I have a pair of bright red suitcases, which, even with my terrible eyesight, I can spot from a hundred meters away, so while the designs are really cute, I wasn’t keen on them. The lovely people of Wanderskye though, graciously sent me a backpack cover, and I find it to be a good addition to any backpacker’s gear. Not just for the amazing designs by Filipino artists, the cover protects your bag from the elements (very important if you are traveling with a laptop that you need to be able to work), and discourages (or at least makes it harder) shady characters from nicking things from your bag (or worse, sneaking questionable items in). The Wanderskye backpack cover retails for Php 895. Wanderskye has a kiosk in SM North, and their products are also available in Travel Club. Or if you’re like me who don’t like going out, you can also purchase from their online store. So while I was looking through Wanderskye’s website a couple of years ago, it was the luggage strap with weighing scale that really caught my eye. While I’m not quite sold on luggage straps, I was on the market for a digital weighing scale for traveling, since I am notoriously overpacking all the time. Function meets ease ?? Get your Luggage Strap with Weighing Scale now at www.wanderskye.com or in-store at @whereiswanderskye ?? I was flip flopping about buying it, until my waiting paid off: they held their anniversary sale, and I was able to get the combination luggage strap and weighing scale at a discount. I quickly bought and used it almost immediately for my trips to Thailand, Japan, and Australia. The cute strap and the combination TSA lock is just a nice bonus to the digital weighing scale, to be honest. I like how I can make sure that my check in baggage is within the limits, and how I don’t have to think about where to cram the scale in my bag after using it. The combination luggage strap and weighing scale costs Php 1,995, and I was able to get it on sale for about Php 1,400. Wanderskye is having their anniversary sale until September 30. If you’re thinking of buying any of their items, this is the time to buy! When fellow Pinoy blogger James introduced Hammock Republic, his own brand of travel hammocks, I was ambivalent about it. Sure, it looks nice, but given as I am a humongous tub of lard, you can understand how I have qualms about trusting it to be able to carry my weight. Last March, on a trip to Balabac, our tour operator gave us two choices: sleep on the tent, or on a hammock. I opted to sleep on the ground and woke up sore all over. The following night, I relented and got on the hammock. Not only was I able to sleep comfortably, it convinced me that I need to buy one. 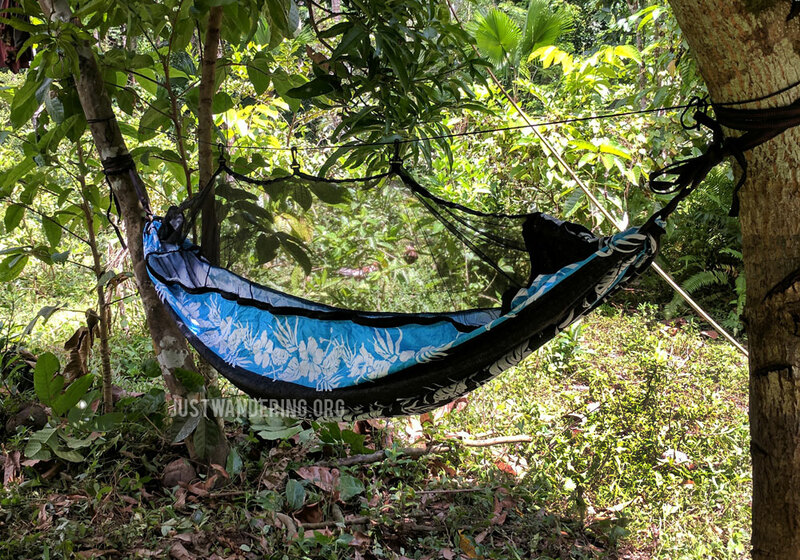 I’ve been staying here in Bulusan for the last couple of weeks, and the occasional power outages have driven me out of the house and into my hammock for some fresh air. Definitely one of the best buys I’ve had. The fabric is cool to the skin, it’s very sturdy, and the built-in mosquito net is godsend. The hammock also rolls and fits in a case shaped as a neck pillow, so you can still use it even in transit. Duoyan is a very clever name for it, indeed! The Douyan is priced at Php 1,400. You can purchase online through the Hammock Republic Facebook page. When I purchased my Duoyan, James includes a set of travel pouches for free. The pouches are actually made with the extra material from making the hammocks, so very little of the production materials go to waste. Pretty smart, eh? These pouches are sold in sets of three for Php 200. Uniqlo is a great place to shop if you want good quality travel clothes without shelling out too much money. They have the Airism line, which are really great, breathable fabrics that are great for layering, and Heattech for when you’re traveling to really cold places. My favorite though, is their pocketable parka, which is very light and packs really small. I used to hate waterproof jackets, because it tends to get really hot when you’re wearing it, but this is very thin and breathable, yet it keeps you dry (well, your head and your torso anyway). The parka comes with a small bag where you can stuff your jacket in, but of course, I lost it immediately. However, even without the pouch, you can stuff the parka into its own left pocket for easy storage. The Uniqlo Pocketable Parka retails for around Php 1,490, but I was able to get mine on sale for Php 1,100. Depending on the design (if they’re phasing it out), you can even get it for Php 950. This is one of those things that I’ve thought about buying, but eventually give it a pass because it’s not really a necessity. So when I got the chance to have a mini-shopping spree at ROX, this was one of the things I picked up. I’m so glad I did. While I bring a backpack when I travel with my laptop, it is too cumbersome to bring out that backpack when I’m just going around town. The backpack packs into this really tiny ball, but I can actually fit my 13″ laptop inside, along with my water bottle and my packed lunch. The backpack material is really light, so there’s no added weight when you have it on your back. Of course, you can’t expect the same support as a “real” backpack, but for day trips, this is perfect. 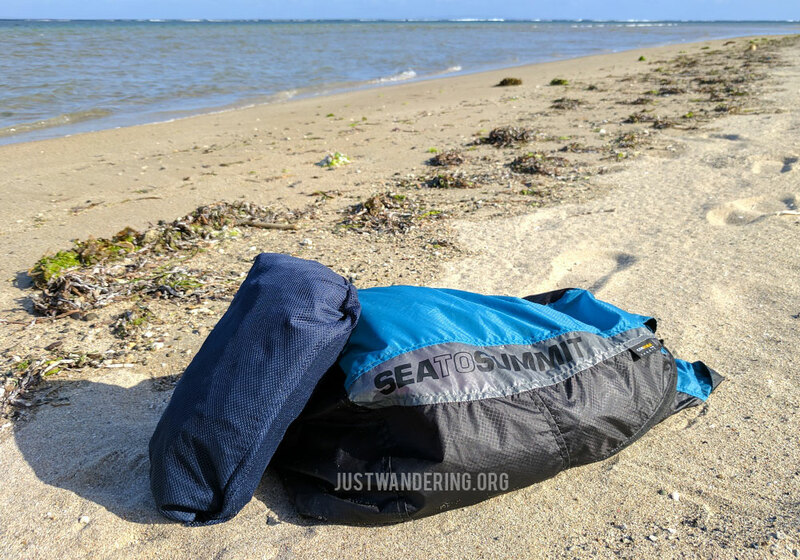 The Sea to Summit Travel Day Pack is available at Travel Club and ROX. It sells for around Php 1,100-1,300.